Do you know what QuickFlightTracker Toolbar is? QuickFlightTracker Toolbar is one of the Mindspark family toolbars. Like many of the company’s other created tools, it falls under the classification of potentially unwanted programs. Our computer security experts say it is because the application encourages users to surf the Internet with a doubtful search engine that may show them unreliable advertising content. Therefore, we would not recommend installing it, and if you already did, we advise erasing it before anything goes wrong. If you do not want to, you can eliminate QuickFlightTracker Toolbar with the removal guide available below the article. Also, by reading the rest of our report, you can learn more about the potentially unwanted program, for example, where it might come from or how it could work. The potentially unwanted program is promoted on quickflighttracker.com where QuickFlightTracker Toolbar is described as a tool that can help track flight status for United Airlines, Delta, Southwest, Lufthansa, and so on. However, we believe it could be spread through other channels as well, for example, pop-up advertisements, bundled software installers, and so on. One way or the other, it signals you have to be more cautious if you do not want to receive such questionable programs in the future. We would advise researching suggested or chosen applications before installing them as for the software to be trusted it must come from reliable developers and should not have any bad reviews. Plus, it is crucial the installer is downloaded from a legitimate source as otherwise it could be bundled with various untrustworthy programs. Another thing is it is best to pick custom or advanced installation settings and view all given information carefully. It may not only allow you to identify suspicious software, but also deselect bundled suggestions. 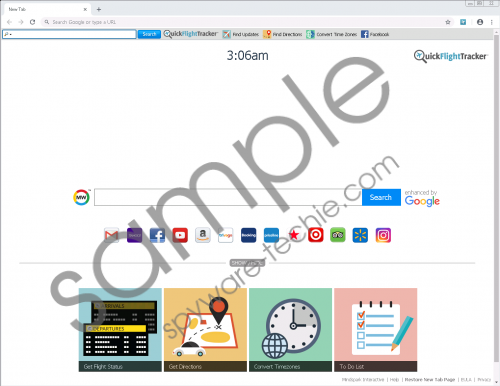 Should you decide to erase QuickFlightTracker Toolbar, we can offer our removal guide that will show what to do if you want to delete the application from Internet Explorer, Mozilla Firefox, and Google Chrome manually. In case it looks too complicated, you could download a reputable antimalware tool with which you could perform a full system scan and then get rid of all possible threats by pressing the given deletion button. Press Enter and search for the potentially unwanted program. Locate QuickFlightTracker Toolbar and remove it. Navigate to the Start menu. Pick either Uninstall a program or Add or Remove Programs. Click the suspicious application and select Uninstall. Insert Control Panel and press OK. Select the potentially unwanted program and press Uninstall. QuickFlightTracker Toolbar is a potentially unwanted program created by an unreliable company called Mindspark Interactive Network Inc. that is known for developing such tools. While the application is not malicious or dangerous to the system, our computer security specialists say it could display unreliable advertising content. We cannot know for sure, but there is a possibility some of the ads might redirect users to potentially dangerous websites, sites offering other potentially unwanted programs or even malicious threats, and so on. Naturally, if you do not want to risk coming across such content, you may want to get rid of this questionable application before anything goes wrong. The removal guide you can find a bit above this paragraph will explain how to eliminate the toolbar manually. The other way to erase it is to employ a reputable antimalware tool of your choice. Tags: delete QuickFlightTracker Toolbar, QuickFlightTracker Toolbar, remove QuickFlightTracker Toolbar.